Florida State quarterback Jameis Winston shoved an official out of the way in the third quarter of his team’s narrow 20-17 win over Boston College on Saturday. The ESPN announcing team laughed when it happened, and no penalty was called. But after the game, officiating experts from both ESPN and Fox Sports came out and said it should have been a 15-yard penalty and Winston should have been ejected for touching an official. Judging by the circumstances and Winston’s comments after the game, it’s clear that he got caught up in the moment. The game was tied 17-17 in the third quarter when the incident occurred. 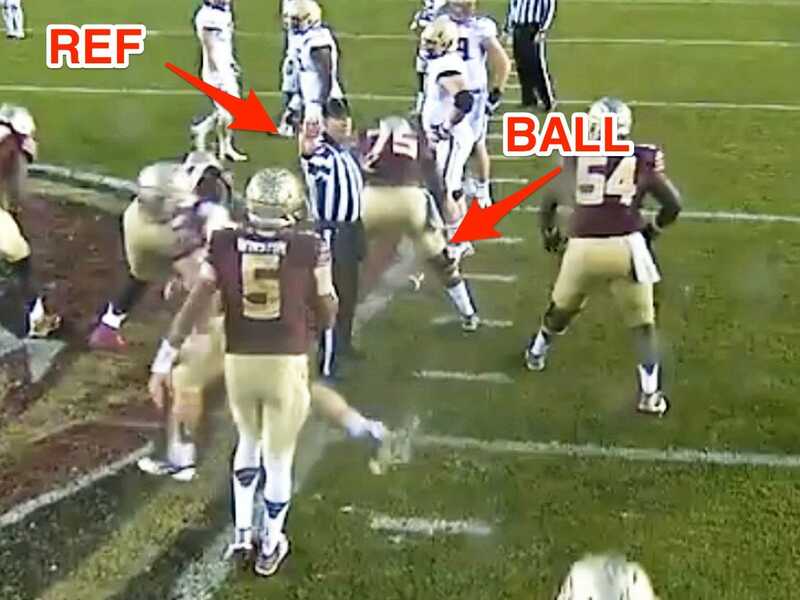 FSU was driving down the field running an up-tempo offence, and Winston was trying to go as quickly as possible. After picking up six yards on 1st down near midfield, Florida State made a quick substitution and tried to run a play. Under college rules, when the offence makes a substitution, the defence also has to have a chance to make a substitution. You’ll often see an official stand over the ball until it’s clear that the defence is ready. That’s what the official was intending to do here. “Oh, [the ref] said we had changed a running back somewhere. I don’t know. Never mind. I’m going to shut up. I’m getting a little perturbed on some of that stuff. “This wasn’t accidental, folks, this was on purpose,” Fox officiating guru Mike Pereira said after the game. Winston didn’t have any malicious intent, but he consciously shoved a ref, which should result in an ejection based on the rules. We’ve seen guys get ejected for much less.